Two more good meals in DC, last night at graffiato, the top chef personality mike Isabella’s inventive Italian small plates and pizza joint near gallery Place. And tonight superb crab cakes at legal seafood in Reagan national airport. Plane is filling up again so signing off. Filed under airfare, Washington D.C.
Back to bitter cold wind but at least it was sunny and after brief rain yesterday pm there was a stunning rainbow out side our sons’ row house on Meridian Place. We started with a morning pastry around the block on 14th st. at Le Caprice and then drove to the FDR Memorial, one of my favorites, where we found a handful of cherry blossoms still hanging on in bloom (a Myra must!) and a statue that seemed to have been added of FDR unambiguously in a wheelchair. Then onto thE MLK memorial, a short walk away. It always impresses me how accessible these memorials are – you just pull-up a short distance away, park for free, and walk a short distance (especially on an unseasonably cold Tuesday in April ), but I am guessing this is by design. This is the people’s city, right? WE were also struck, while reading the quotes at both memorials, how much the quality of our so-called leaders (republicans) oratory and thinking has declined since the era of FDR and MLK. For lunch we went to Union market and then walked around a. Litteri, an old jam packed Italian market nearby. The area reminded me less of DC and more of detroits eastern market. Quick visit for coffee to Zombie cafe near the Columbia heights metro station and a sad farewell to myra who hit the road to return to Connecticut. Loved our visit!! Ps tips for dog shedding frimandrea: Sergeants des heeding brush on Amazon and swiffer for dog hair! 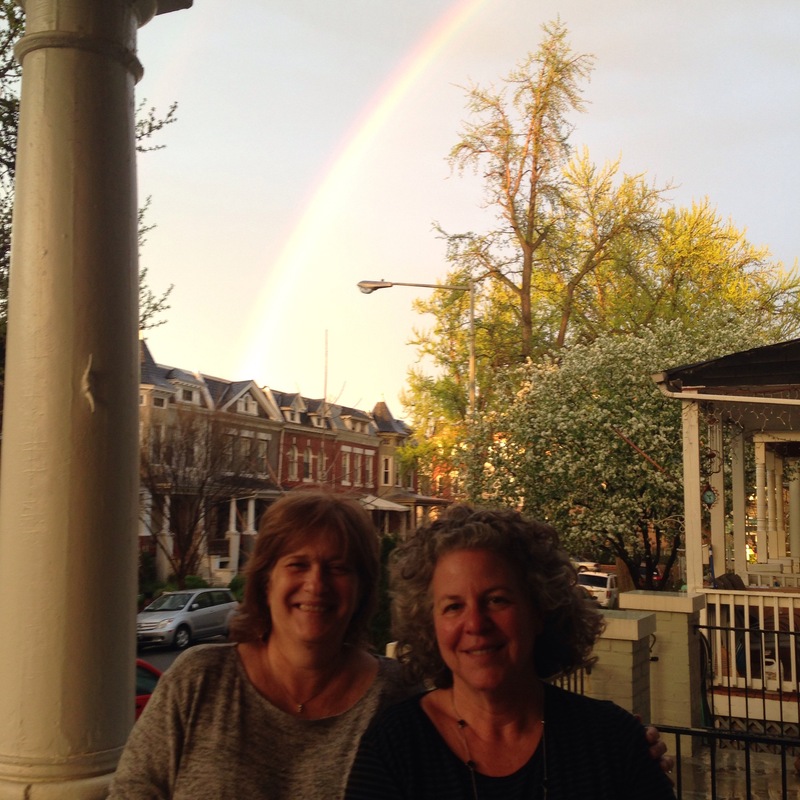 Reliving my youth with my college roommate Myra at our sons’ shared house in DC’s Columbia Heights neighborhood. They have introduced us to more great dining within walking distance of their house. DC Noodles on U street (pad see ew!) and Mi Cuba (Cuban roast pork, fried pork cubes, cassava, plantains, flan, mojito, sangria!) Great company and food. Myra and I had brunch at La Coupe on 11th street (hash brown bowl!) then walked all around the area down 14th street to u street and then over 8th street and the rapidly gentrifying Shaw neighborhood (warby Parker, dodge city, Salina …two Kansas names, no less). Much warmer day than yesterday morning when I watched Noah run in the cherry blossom run on the mall. Sunny but bitter cold wind. Didn’t expect to be that cold. But such a treat to be hear. Sunday the millennial cooked an elaborate and delicious brunch. Three of four house mates moms happened to be on hand, and then a bunch of visiting friends, maybe 15 people total. We drank mimosas, did the Sunday crossword puzzle online on the tv screen and sat around talking for hours. Loved it! Within the first 20 minutes of my visit to the Holocaust Museum in DC today, I got quite the surprise. During an early display about book banning and burning in Germany, at the start of the Nazi era, several names were etched into the glass in front of some photos and videos and one name jumped out at me because it was my own: Rubiner. The first name was Ludwig. I was stunned. Rubiner is an unusual name and I’ve long assumed that any Rubiners are related to me. I had not heard of Ludwig. My dad seemed to know of him but I don’t know if he is a relative. apparently he was a poet and critic who specialized in expressionism and lived in Berlin, dying in 1920′ according to a man I spoke to in the research area of the museum on the second floor. will have to do some more research. I did use the museums database to find several other Rubiners linked to the holocaust in ways not very clear and some Reibmans (my grama’s maiden name). Some were from Kraków and Poland and Berlin, three places I visited a few years ago. on a more cheerful note, I visited my son at his new office in the Hart senate building, (not far from my sisters office there),and we had a good Indian meal at Indigo, (Indian to go) a very casual place where you order at a window and are served in paper trays in a small room covered with intentional graffiti. There are a few tables inside and picnic tables outside, which people were sitting at thanks to glorious and surprisingly warm temps. i also stopped briefly in the Native American museum (must try their cafe sometime, which serves food from several regions). Also caught a glimpse of the African American museum rising up near the Washington monument. Really looking forward to that museum, in part because I have heard a lot about the architect. I am now in Baltimore at the hotel Monaco after an easy and pleasant Amtrak train ride. Filed under museum exhibit, train, Washington D.C.
Great to be visiting Noah a newcomer in DC — plus my sister and husband who sare old hands here. first stop the charming red brick row house Noah shares with three people in Columbia heights, including my dear old pal/ college roommate Myra’s son Dan! the house reminded me so much of my grandparents red brick row house in Easton Pennsylvania, but Noah’s neighborhood has a lot more going on. Noah and I shared some good cheesecake at a bakery on 14th street in his neighborhood and later were joined by my sister, brother law and Noah’s roommate dan for Laotian food, also ion 14th street. Really fun day! Filed under museum exhibit, THE ARTS, Washington D.C.
ben’s chili bowl, rosa Mexicana : Washington, D.C.
Didn’t have much time to be a tourist this trip but I did go to a reception at Rosa Mexicana, which had good -you guessed it – Mexican food — near the gallery metro stop (and hotel Monaco, where my work meetings were). I also had a bowl of chili at the Reagan national airport outpost of the famous Ben’s chili bowl. Didn’t bowl me over. But it obviously lacked the more urban atmosphere of the original Ben’s. I had hoped to go to the ramen noodle place, daikaya izakaya, my sister highly recommended, also near the gallery metro but ran out of time. Next trip. Last night I made my requisite pilgrimage to Politics and Prose, a longtime favorite bookstore on Connecticut. Always have to buy a book there, every DC trip! Filed under Agritourism, Airlines, Washington D.C.
Coppi, Newt, 14th street, Amsterdam falafel : Washington, D.C.
I’ve been reluctant to go to Italian restaurants in the u.s. After two weeks of eating the real deal in Italy last fall but Coppi, a small neighborhood place in DC’s Cleveland Park neighborhood was excellent. My sister and I shared an appetizer sized plate of pasta with tomatoes, grilled shrimp, feta and then pizza. Also had an easy flight –direct– from Des Moines to DC — and this being Iowa, my fellow passengers included Newt Gingrich, his helmet-haired wife and lots of reporters who had been attending a conservative Republican gathering of possible presidential candidates in Des Moines. Today my sister and I walked around 14th street, exploring the little boutiques and vintage stores there. had a very good lunch at Amsterdam falafel. (Excellent grilled eggplant side). Some good stores including: good wood, millennium, and home rule.